When I first went to Melbourne a few months ago, I noticed that the local coffee scene is very different than Malaysia, and very vibrant. Every other corner is a cafe, mostly locally owned and operated with some international chains like Max Brenners. Restaurants and breakfast places like too usually serves excellent coffee (MART 130 is an absolute must visit). It is a land where Starbucks aren’t doing well at all with their, as some agrees, watered down coffee. 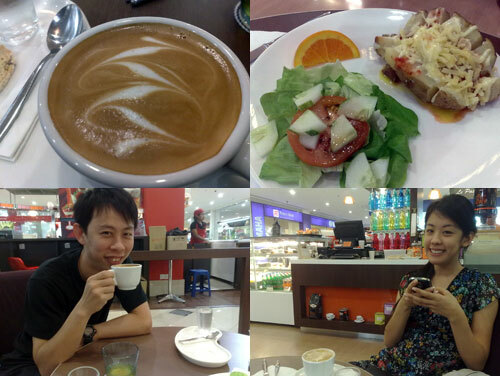 After getting spoiled with good coffee from down under, Mellissa then decided that we should hunt for the best coffee in KL, and her housemate Jun Wei happened to know just the place we need to go. Le Passione Cafe at Hartamas Shopping Center. Other than 2 cups of flat whites (they are similar to latte, but served in ceramic cups), we also ordered a breakfast set and a baked potato during that particular late afternoon snacking session. The coffees were excellent, smooth, creamy, and very flavorful. 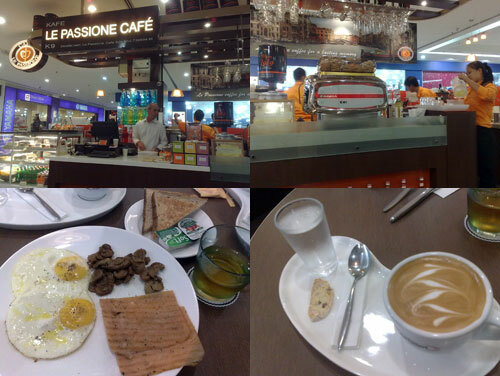 They’re worth every sen of the RM 7.95 Le Passione Cafe charges (with 10% service). A piece of biscotti and a shot of cold water accompany the coffee too. The food however, were rather disappointing. The eggs were nice, but turkey ham and those canned mushroom were pretty miserable, baked potato wasn’t anything to shout about either. For really good coffee around town, go to Le Passione Cafe, but eat at your own risk. 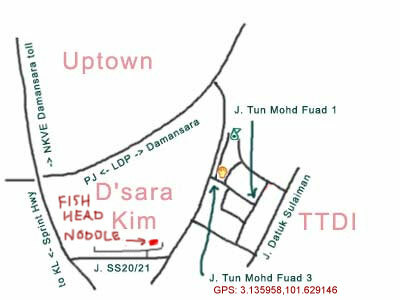 I first heard about this fish head noodle at SS20 (Damansara Kim) place from my ex housemate Kerol, and soon after that, on masak-masak. Since these two ladies are known for their culinary exploits, I knew that this is surely a place that will not disappoint. 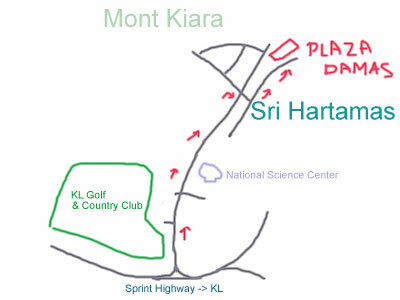 So together with Horng, Kerol, and TBG (who didn’t eat cos she was on diet) we made our way to Damansara Kim one Saturday for brunch. 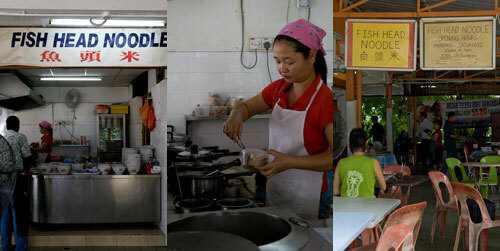 The fish head noodle stall is located at a municipal food court (in this case, MBPJ), which translate to plastic tables and chairs under tin roof. However, the good news is that there are plenty of electric fans blowing everywhere so it was actually quite airy and pretty comfortable. 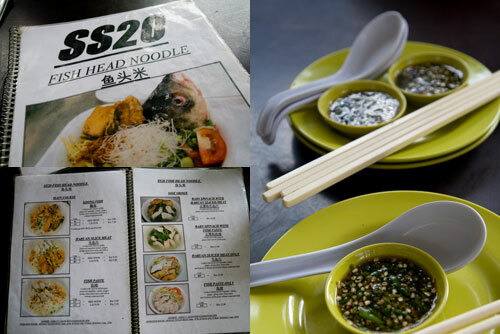 Unlike other stalls in food courts around the country, the fish head noodle at ss20 actually provides a menu with photos of each dish offered. Here you can order Soong fish, Haruan (snake head), mackeral fish paste, and even salmon. I ordered a bowl of Haruan fish head with meehun. The fish came in both deep fried and fresh slices and I liked them both. 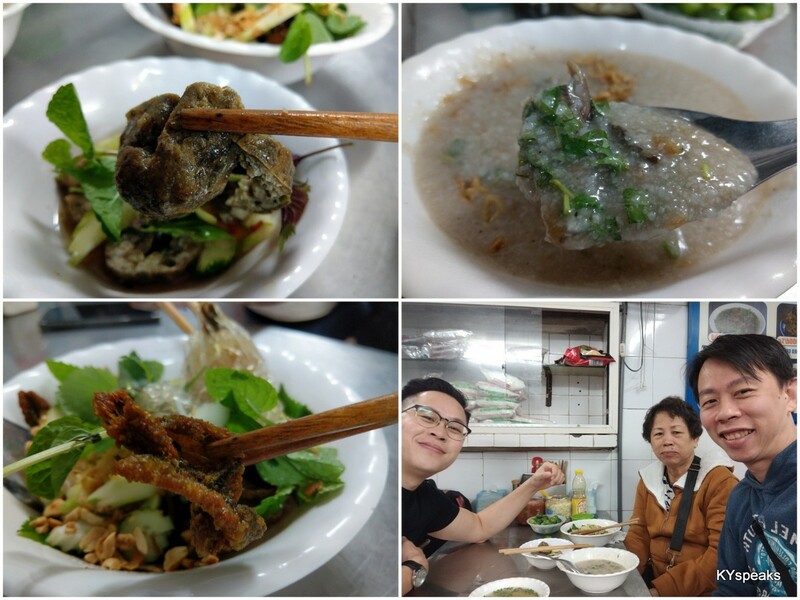 The soup had all the ingredients you’d expect in any proper fish head noodle – tomato, spring onion, ginger, deep fried shallots and garlic, preserved vegetable, and evaporated milk. The noodle springy, the fish was fresh and tasty, and the soup too had all the proper mixture of taste – sweet, salty, savory all at once. 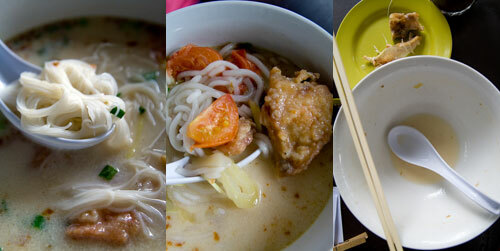 I actually liked it quite a lot despite my natural preference to the fish head noodle with clear soup (Penang style). 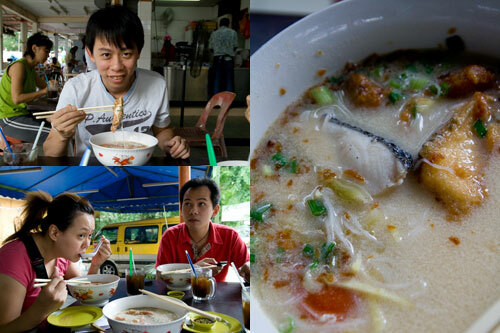 A bowl of fish head noodle starts from RM7 (Soong fish and fish paste) to about RM 9.50 (Haruan). Side orders of fish slices and fish paste without noodle goes for RM 12. Cendol in a glass and other drinks are also served here. As with a lot of MBPJ food courts, this place is pork free. Now who is up for some fish head noodle this weekend? For those who hasn’t yet signed up a Twitter account, please immediately do so and add me at @kyspeaks. And for those who don’t know what is twitter or what the fuss is all about, well, simply put, Twitter is both a micro-blogging platform as well as a social network that is limited to 140 characters per update. Read the wiki here. The social networking part of it too is very simple, your personal twitter main screen only shows those you follow, and there’s also pages to show those who notified you via the @kyspeaks mention in their twitt, and also Direct Message that works a bit like email/sms. On top of that, you can also search for and follow certain keywords in everyone’s twitts, and the current hottest 10 keywords will show up in twitter’s page as “trends”. The last usage of twitter is my favorite, I use my mobile phone to update and read other’s twitts on the go, and it’s awesome to be able to take a picture and write in an instant and be able to share with those who follow me for whatever reasons. Mellissa decided that I should smell this awesome conditioner from Guardian, and proceed to squish em all over my nose. 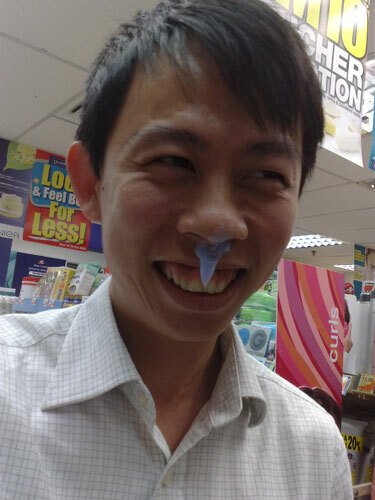 The lady only wiped it off my nose after laughing hysterically for about 5 full minutes. Suanie‘s nephew, Ryan was overly active and always wanted to play. 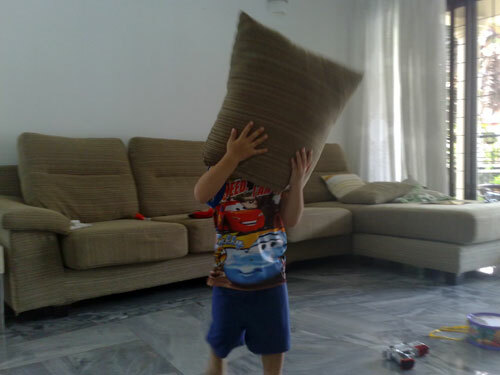 So I thought it’ll be cool to ask him to be a pillow head man. The poor boy didn’t know better and obliged. See, playing with little kids can be fun and extremely entertaining sometimes. My colleague Suhana thought it’s immensely funny when she spilled coffee all over lecture notes during a training session on some specialized software applications. 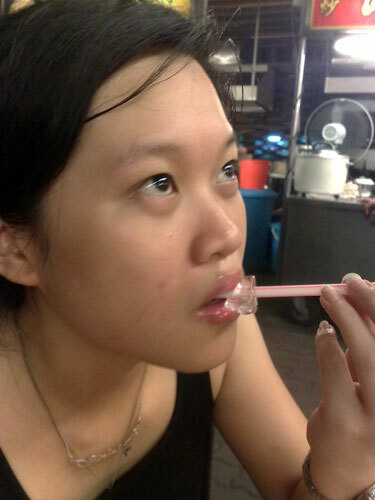 Kim trying to cool down her lips after eating this super spicy Taiwanese sausage at Ming Tien at Taman Megah. 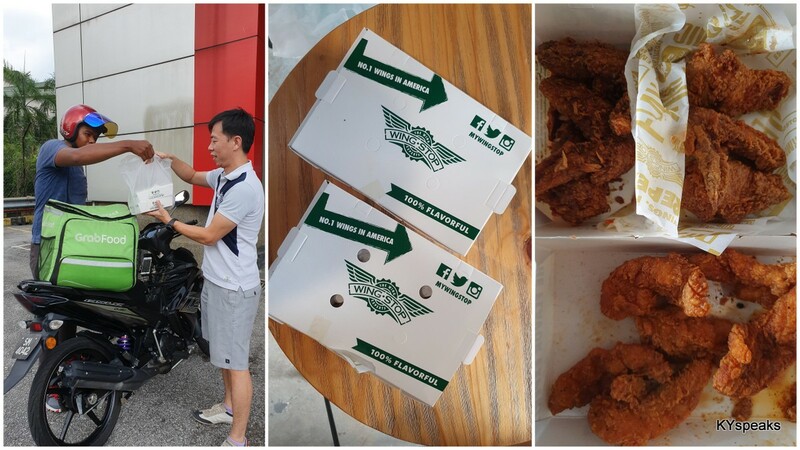 It was also easily the most spicy thing I’ve eaten in Malaysia (habanero experience in US was a lot worse). So get on to Twitter and follow me! 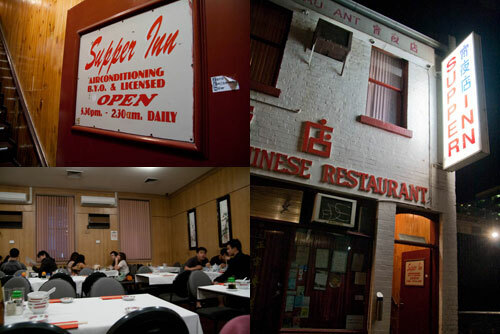 I thought of Supper Inn just as I was reading Lainie’s latest post on Shanghai Dumpling, both are bargain basement old fashion Chinese restaurants (as in oversea Chinese restaurant) in Chinatown at Melbourne CBD. Supper Inn is located right in the middle of Chinatown, a little alley by the name of Celestial Avenue (can’t get a more Chinese name than that) just off Little Burke Street. 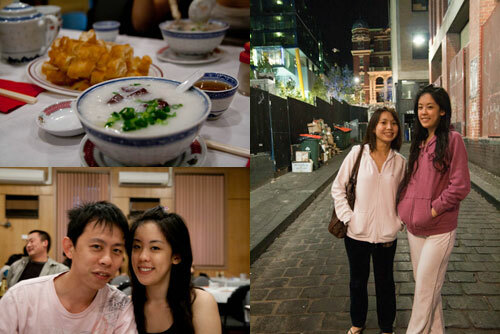 The restaurant operates from 5:30pm till 2:30am daily, hence it is one of the only places to eat in CBD after midnight. The dining area is located on first floor, with really old school interior deco and even older waiters. The place is, however, air conditioned and generally quite clean. Business seemed to be brisk even though it was past midnight in midweek when Pinky, Mellissa and I went there last April. 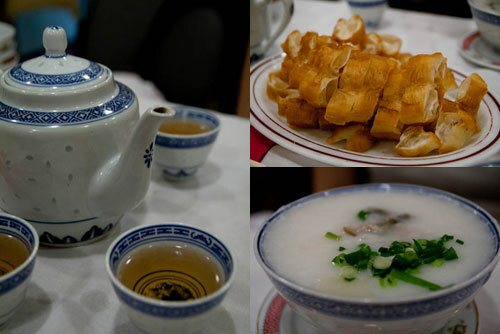 The menu at Supper Inn isn’t exactly very extensive for a Chinese restaurant, but you do get to choose from over a dozen types of soup and porridge, a few appetizers, and entrees. 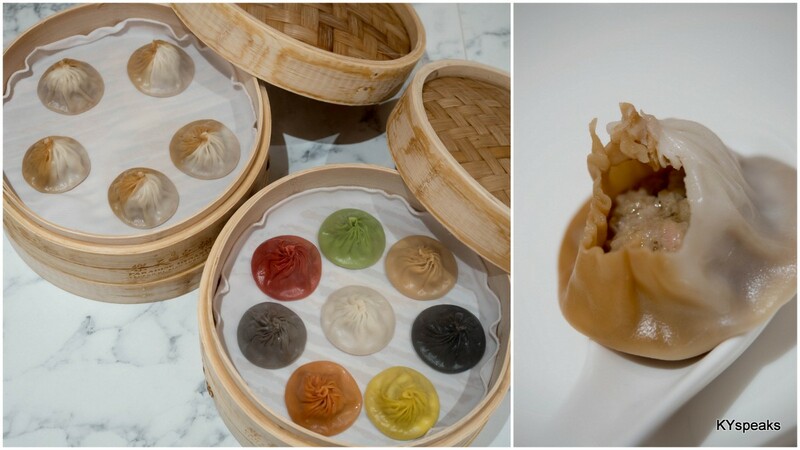 From duck and mushroom soup, sharks fin soup, the venerable hot and sour soup, and more exotic items like duck’s tongue, abalone porridge, and coagulated pork’s blood porridge, they do have most of the essentials. I knew what I had to order the moment I looked at the menu, the coagulated pork blood porridge ($6.50)! 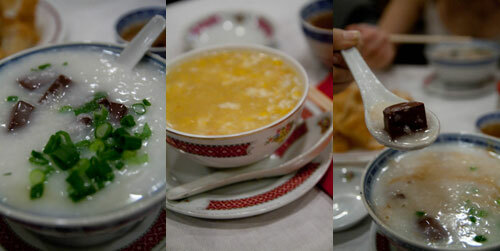 Mell had the minced chicken with sweet corn soup ($6.00) while Pinky ordered the century egg porridge ($6.50). We also shared a pretty large serving of yau char kuai ($6.00) to share. The porridge were very good, cooked to the point where individual grain is indistinguishable like how Cantonese porridge should be. And of course, coagulated pork blood never disappoint, it is something that is not easy to find even in KL (I usually get my fix from lorong seratus 100, ss2), and I wouldn’t have thought I’d get them in Melbourne, bliss! Sweet corn soup was pretty good too, but the yau char kuai (some might call it Chinese donut..) was a bit of a let down by being soft and slightly oily though still edible. However, Pinky said that this is an exception rather than rule, they are usually crispy and tasty, I guess I’ll just have to take her words for it. Bill came to about $25 for the three of us. Chinese tea, as with ice/warm water in other restaurants, are usually free in Melbourne. 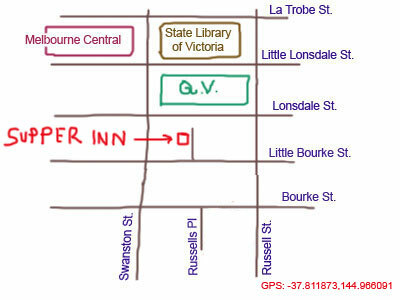 So if you are craving for some chewing optional supper in Melbourne, this is the place to go. 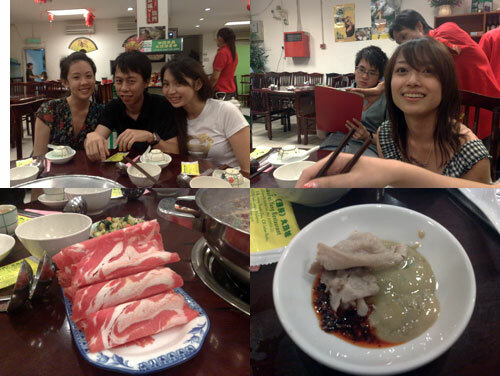 About a gazillion years ago (which means slightly less than half a year in late January), a bunch of us decided to give Pinky a farewell dinner at Xiao Fei Yang steamboat restaurant prior to her departure to Melbourne for further study. The restaurant is located just behind Berjaya Times Square on Lorong Thambi Dua, not far from the best roasted pork in town at Wong Mei Kee. the condiments and two types of soup, spicy! 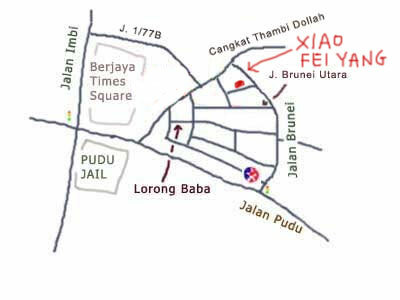 Though located in the older part of KL with horrible parking situation, Xiao Fei Yang benefits from having an empty lot just right next to the restaurant. If you’re willing to part with RM 1-2, there shouldn’t be a problem. While not decorated with fancy furniture and design, the restaurant is clean, air conditioned, and pretty comfortable. But as with most Chinese buffet that is in air conditioned area, you risk smelling like what you just ate since Korean-style ventilation is non existent. 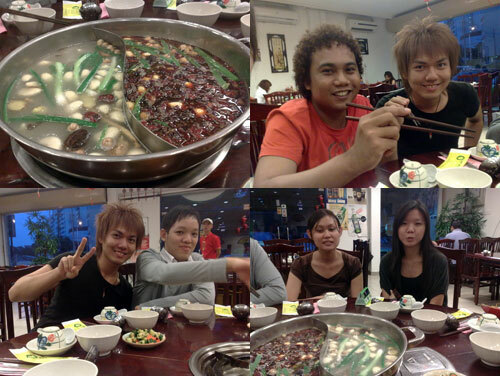 Steamboat at Xiao Feing Yang is closer to Sichuan (like the one at Jin Shan Cheng, Sunway) and Mongolian (check out Inner Mongolia steamboat at Pudu) style. The restaurant claims that the soup is boiled for 12 hours with some 30 different Chinese herb, it is supposed to have beautifying and healthy effect on you.. but I only worry if it’s tasty anyway. The ten of us ordered lamb, beef, and possibly pork. 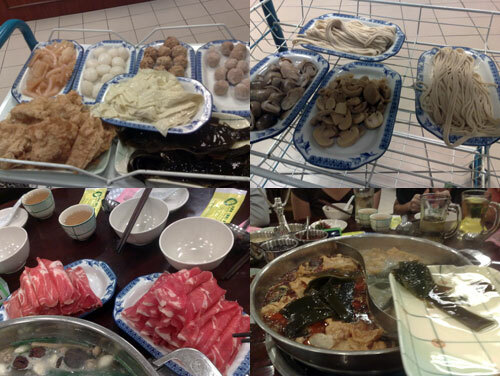 There were also fish ball, meat ball, two types of tofu skin, cuttle fish, mushroom, vegetable, seaweed, and noodle. There were other more exotic ingredients but I guess some of these guys aren’t exactly the most adventurous when it comes to food. As for the soup, we had both the herbal and the spicy version. Basically the spicy version is just the herbal soup with chili oil added. They come with quite a lot of herbs I can’t name (I remember seeing green onion and red dates), and they add up to give the soup a very sweet and rather sumptuous taste. The thing that I like most about the steamboat is the condiments. Chili paste and fermented tofu paste with freshly boiled lamb or beef can be very addictive. A word of advice though, always start with the clear soup and work your way to spicy but not the other way around. 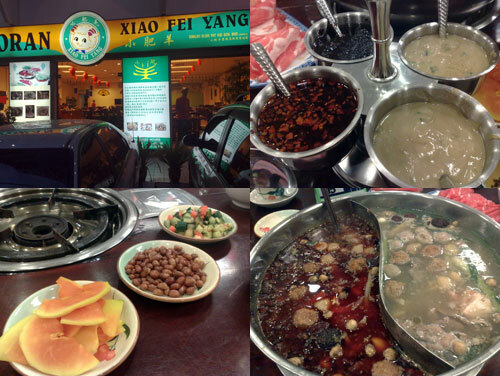 It was a pretty satisfying dinner even though we didn’t order anything luxurious (ie: more meat, maybe seafood too?). The bill came to be around RM 20 per person if memory serves me correct. Xiao Fei Yang is not very different from the other two steamboat places mentioned, a place that is worth going if you’re into spicy steamboat with plenty of meat.